Freedom Rockz: Get Ready for Leftover Turkey with these Recipes.Yes Please! Get Ready for Leftover Turkey with these Recipes.Yes Please! I don't know about you but as for me by the next day I am all out of recipe ideas. I am usually so burnt out from cooking all day Christmas that I just don't have a creative bone left in my body. This is a great collection of leftover turkey recipes. 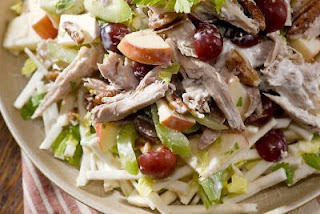 I love the turkey salad idea I definitely make that one every year. Yummy! Thanks Food Network! Love it!